I’m distinguishing this one from Sam’s Green Two-Snap Coat with the word “Panel” because there are way more seams on this coat than there necessarily have to be. It seems to be made up of different sized panels stitched together. The two breast pockets do up with one snap that is mostly invisible. The breast pockets have two seams running down their middle, and there are two horizontal seams in the jacket midway between the pockets and the bottom. It does up with a zipper. Brand Information: Possibly a custom replica of a Guess brand jacket. It first appears in Heart (2x17). Sam wears it anytime he is outside for the entire episode. He wears it briefly inside when they first talk with Madison – when they return and he decides that he should stay and watch Madison, he takes off his coat at some point while they are watching TV. He wears it inside again at the very end of the episode when he has to shoot Madison. In Folsom Prison Blues (2x19), Sam puts it off after they escape from prison. He takes it off momentarily to dig up the grave. In The Magnificent Seven (3x01), Sam wears it for the entire episode. In The Kids Are Alright (3x02), Sam wears it when Dean drops him off at the motel in Cicero, and when they go after the monster and rescue the kids. In Bedtime Stories (3x05), Sam wears this jacket for the entire episode, only taking it off when he has to wear a suit – and briefly taking it off as they check out the old woman’s house in the woods, though he puts it back on before they leave. In Red Sky At Morning (3x06), Sam wears it at the very end of the episode when he and Dean talk in the car. In Mystery Spot (3x11), Sam wears puts on this coat when they leave for breakfast every Tuesday, and on both Wednesdays. In Ghostfacers (3x13), Sam wears it for the duration of his time in the Morton House. In Time Is On My Side (3x15), Sam wears this coat when he goes after Doc Benton alone and rescues the girl. In Are You There God? It’s Me, Dean Winchester (4x02), Sam wears it when he leaves on his pie-run and runs into Ruby, he keeps it on until Bobby shows them the panic room. He takes it off briefly while in the panic room, and then puts it on again when it’s time to shoot ghosts while Bobby does the spell to save the day. Sam takes off the jacket to sleep. In Metamorphosis (4x04), Sam is wearing this coat at the beginning of the episode when Dean catches him exorcising demons with Ruby. Then, in a rare continuity error, Sam wears this coat ONLY when he is trapped inside Jack Montgomery’s hall closet. In It’s The Great Pumpkin Sam Winchester (4x07), Sam is wearing it when they return to the motel after failing to find the witch and he meets Castiel for the first time. He keeps it on until after he exorcises Samhain. In Wishful Thinking (4x08), Sam is wearing it upon arrival in Concrete, WA. He takes it off while interviewing the girl at Lucky Chins, and when he is in the hotel room, but otherwise wears it for the entire episode. In The Monster At The End of This Book (4x18), Sam wears it when they go to see Chuck’s publisher and both times they go to see Chuck together. He takes it off when he is in the Laundromat, and after Dean leaves him at the motel. He puts it on again when they drive away at the end of the episode. In The Rapture (4x20), Sam wears it for the entire episode, except when Jimmy his eating his burgers in the motel room. He takes it off before going into Bobby’s panic room at the end of the episode. 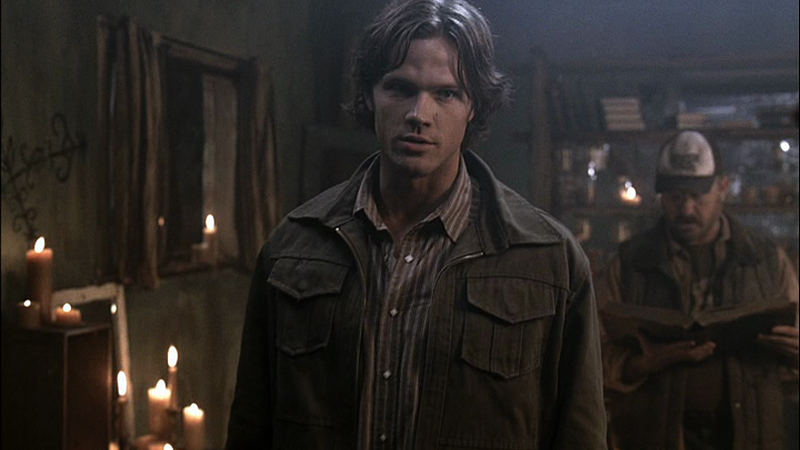 In When The Levee Breaks (4x21), Sam grabs it on his way out the door once he gets out of the panic room. He puts it on before Bobby confronts him in the scrap yard. He doesn’t wear it while inside the hotel room with Ruby, but has put it back on before Dean shows up. Sam wears it throughout Lucifer Rising (4x22) – because he literally was left with only the clothes on his back when he walked out on Dean. He continues to wear it in Sympathy for the Devil (5x01), except when he and Dean are in the hotel room when Becky arrives and when Bobby arrives. In Good God Y’All (5x02), Sam wears it from the beginning of the episode until they defeat War. In I Believe The Children Are Our Future (5x06), Sam wears it to the joke shop, and then to the hospital to get the story on the guy who had his teeth pulled. He keeps it on while he shows Dean the map with Jesse’s house in the centre – and then he changes back into a suit. He uses the coat again only at the end of the episode when he and Dean rush over to Jesse’s house to find Castiel. In Changing Channels (5x08), Sam wears it when he is in the sitcom. In The Real Ghostbusters (5x09), Sam wears it at the end of the episode when he says goodbye to Becky and Chuck. Sam’s body wears this coat for the entirety of Swap Meat (5x12). Sam only takes it off (to hang it on the back of the chair), when he and Dean are eating at the diner. In Dead Men Don’t Wear Plaid (5x15), Sam starts wearing this coat as soon as he changes out of his suit. He only takes it off when he and Dean sit down to eat pie with Bobby and they chat about the possible arrival of Death. In 99 Problems (5x17), Sam puts it on once he gets out of the car in Blue Earth, MN. He wears it for the rest of the episode, except when he and Dean are at the bar, and when he is in the motel. In The Devil You Know (5x18), Sam wears it for the entire episode. In Live Free or Twi-Hard (6x05), Sam wears it whenever they are not inside the motel, the only exception being the very final scene of the episode in which he and Dean talk in the parking lot – for that scene he is in a different coat. In All Dogs Go To Heaven (6x08), Sam wears this coat when he and Dean talk on the picnic bench at the very end of the episode. In Caged Heat (6x09), Sam wears this coat for the whole episode. We see him take it off when he and Dean enter the house they are staying in, then he puts it back on after Meg and her goons leave. He only has it off again when Cas tries to use a spell to locate Crowley, and when they are in the house reading after coming back from raiding Samuel’s office. In Mannequin 3: The Reckoning (6x14), Sam wears this coat when he returns to the factory to rescue the guy. He wears it until the ghost is dispatched. In Frontierland (6x18), Sam wears this coat from the beginning of the episode, when they go to the Campbell library, until Bobby finds the information that a phoenix might help them, Sam discards the coat as they renew the search through the library for information on phoenixes. He wears the coat again when it’s time to travel to 1861, and keeps it on for the rest of the episode. In The Girl Next Door (7x03), Sam wears this jacket when he goes to the store for snacks. He takes it with him when he leaves the cabin later that night. He wears it for the rest of the episode, except when he briefly wears a suit while talking to the coroner, and when he’s talking with Dean inside the motel room. In Shut-Up, Dr. Phil (7x05), Sam wears this coat from when he comes back to the motel room with the chicken feet until the end of the episode, taking it off only briefly just before the leviathan attacks. In Slash Fiction (7x06), the leviathan impersonating Sam wears this jacket. In How To Win Friends and Influence Monsters (7x09), Sam wears this coat when he, Bobby, and Dean are hunting the monster through the woods. He takes it off when they autopsy the body and while eating at Biggerson’s, but otherwise keeps it on for the rest of the episode. In Death’s Door (7x10), Sam wears it for the entire episode. In Time After Time (7x12), Sam wears this coat on the stakeout with Dean when Dean disappears, and then when interviewing Lila at the retirement home until the end of the episode. It is. I'd say this was Sam's most used coat actually...at least from S3-S5. There's two jackets I consider as typical Sam. The jacket an action figure of him would wear or I would draw him in or whatever lol. Those jackets being this one and the other brown with that is a bit bigger and thicker. Does anybody know what brand that coat is?